(ECNS) -- Lancelot Zuma, son of South African President Jacob Zuma, was spotted taking gulps of Pepper Soup in Zhengzhou, capital city of Henan province. 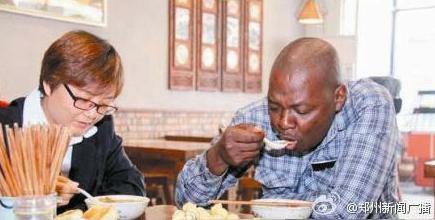 Zuma junior was photographed by quite a few diners in a restaurant near Huayuan and South Guangdian roads in downtown Zhengzhou on Saturday. Pepper Soup is a famous local dish made from pork broth, several Chinese herbs, peppers and chili. This is Zuma's second visit to the city concerning a residential real estate project in South Africa. He said the yummy soup is a good appetizer in the morning. He used local dialect to describe the soup, calling it "zhong" (meaning "great").